By Chelsea Tyler Mc Neill | November 29, 2015. Nothing says Christmas in Dublin like shopping around the city centre, and Meath Street is definitely one shopping destination that will get you in the Christmas spirit with amazing deals. The Liberty Market is a little gem in the middle of the street, smothered with gifts for everyone you can imagine. Walking through the little entrance, you are overwhelmed by the narrow aisles with market stalls on either side. However, nothing puts you at ease like the friendly faces and the Christmas decorations. Stall holders are eager to engage and show you all they have to make your Christmas shopping quick and easy. 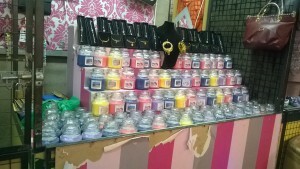 The Liberty Market boasts all of this years most desired Christmas gifts at a fraction of the regular price. There are gifts that would suit everyone in the family but the market is always popular if you are buying for any young girls, with Michael Kors bags and watches on every corner. A Michael Kors handbag costs only €25 and the purse is €12 but you can buy both for €35. Michael Kors watches are only €25 and the very popular Alex and Ani bracelets are just €10. For mum, you are also spoiled for choice. Perfume sets and bath sets for under €30 and Yankee candles for under €10! I’m sure mum wouldn’t mind a handbag or purse either, all the designer handbags come in at €25 with a variety of colours and designs. For the boys, there are tracksuits, aftershave sets and also lovely watches but the most popular stall, which was flocked by young boys, was selling Nike runners for just €40-€45. Another steal that any young guy would love are the Beats by Dre headphones and speaker. The headphones are just €25 while the speaker is €30.